France and Germany are often credited with being the key driving forces behind European integration. However, as Laurent Warlouzet explains, both states have approached the integration process from distinct ideological standpoints, with French dirigism and German ordoliberalism lying at opposite ends of the economic policy spectrum. In an EU without the UK, this clash will continue to be a major factor fueling the EU’s destructive quarrels and decisive compromises. The concept of the “social market economy”, which is now encapsulated in the Treaty on European Union, has always been ambiguous. Coined by Alfred Müller-Armack, a German thinker often associated with ordoliberalism, it has also been claimed by leaders influenced by the French dirigist tradition. To overcome this ambiguity, in a recent study, I gauge to what extent German ordoliberalism and French dirigism have influenced the history of the European Union since 1957, and its definition as a “social market economy”. French dirigism and German ordoliberalism represent relevant case studies because they lie at both ends of the economic policy spectrum. As argued in my recent book, Governing Europe in a Globalizing World, post-1945 economic policies can be divided into three categories: socially-oriented ones, neomercantilist ones and market-oriented ones. Socially-oriented policies are aimed at protecting those more fragile groups, such as the poor, through legislation and redistribution. Neomercantilist policies associate the mercantilist’s aggressive stimulation of national industrial potential with tolerance towards the international free-trade order (hence the prefix “neo”). Blatant protectionism is no longer possible, but more discreet measures, such as state aid or non-tariff barriers, are still enforced. Finally, market-oriented policies put an emphasis on free-market dynamics. Neoliberal policies are a radical variant of the latter. Whereas, French dirigism can be associated both with socially-oriented policies and most of all with neomercantilism, ordoliberalism clearly fits into the “market-oriented” category, and is sometimes associated with neoliberalism. I use two case studies: competition policy and the European monetary union. Competition policy has always been crucial for the ordoliberals, who secured a success with the adoption of an ambitious German competition law in 1957. 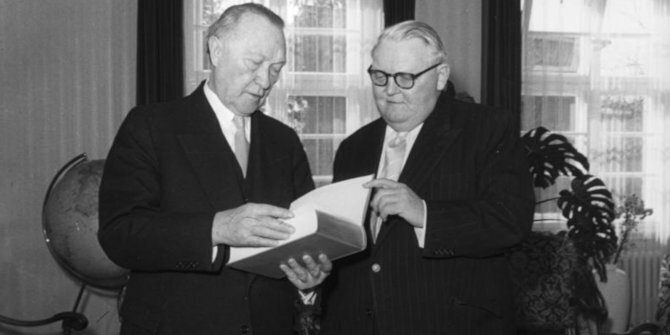 Some German officials at the European Commission influenced by German ordoliberalism – such as the first commissioner for competition Hans von der Groeben – wanted to translate this system at the EEC level. The Treaty of Rome was not ordoliberal, but those officials were successful since the Council adopted Regulation 17/62, which was largely a Europeanisation of the German system, even if it bore the influence of other sources, mainly US and French. Beyond competition policy, this ordoliberal interpretation of the EEC clashed with the French dirigist project of European planning. Von der Groeben had an ambition that extended beyond cartel control. His speeches and internal notes demonstrated that he interpreted the Treaty of Rome as an economic constitution for Europe, much like the ordoliberals did within the German framework. This quest led him to clash with French dirigism, embodied by his colleague at the European Commission, the French socialist Robert Marjolin. When the latter promoted a Europeanisation of the French policy of indicative planning, von der Groeben forcefully asserted that all European economic policies had to be inserted within a free-market framework based on competition rules. It should be noted that in the 1960s, indicative planning sparked great interest in Europe and the United States due to France’s exceptionally high growth rate. Subsequently, European competition policy directly clashed with French dirigisme when the European Commission began to ban state aid (starting in the 1980s), and to control merger and the services of general interests (starting in the 1990s). Those quarrels sometime resulted in high-profile political battles. In 2007, the French President Nicolas Sarkozy opposed the insertion in the Lisbon Treaty of the reference to “free competition” in the article on the Union’s objectives. By contrast, the European Monetary Union at Maastricht appeared at the outset as a compromise between French dirigism and German ordoliberalism. Certainly, since Germany was the more reluctant partner, the system bears a strong ordoliberal mark: the central bank is independent and geared mainly towards an objective of low inflation, and convergence criteria put an emphasis on stability. Nevertheless, European monetary integration cannot be interpreted as a unilateral German victory for three reasons. First, the German government made a huge concession when it abandoned the much-loved deutschmark. Second, leaders of weak currency countries have chosen voluntarily to be inserted into a relatively constraining European framework. They have aimed at limiting their deficits and their inflation for the sake of competitiveness and fiscal responsibility, and not only for the sake of European integration. Third, formerly weak-currency countries have benefited from macro-economic advantages: lower interest rates, lower inflation, and some solidarity. The German government did rescue some weak currency governments during certain monetary crises, notably the French franc in 1983 and in 1992. Even during the Eurozone crisis, a belated financial solidarity emerged grudgingly from Berlin and Frankfurt, too late to preempt the dramatic fate of the Greek people, but early enough to salvage the euro. The debate between both approaches lingers still: Germans influenced by ordoliberalism are still complaining that the stability-oriented rules are too flexible, whereas many French leaders defend the establishment of an ambitious budget for the Eurozone to boost investment, and of a bolder industrial policy aimed at tackling Chinese and US neomercantilism. Crucially, I do not claim that only French dirigism and German ordoliberalism have influenced EEC/EU economic policies. The role of the Netherlands in the birth of the Common Agricultural Policy, or of Britain in the setting up of regional policy and in the internal market programme, to name but a few, are of course essential. But in an EU without the British, the clash between French dirigism and German ordoliberalism will continue to be a major factor fueling the EU’s destructive quarrels and decisive compromises. Laurent Warlouzet is Professor of History at the University of Littoral-Côte d’Opale and a former Marie Curie Fellow at the LSE (Department of International History). He has just published a new book, Governing Europe in a Globalizing World: Neoliberalism and its alternatives following the 1973 Oil crisis (Routledge, 2018).